Growing up in northern Ohio, I learned to recognize the change of season by looking at the trees. Okay, the temperature was an indication, but the most obvious pronouncement of the arrival of fall was the colorful display of leaves gracing the limbs before falling gracefully to the ground. Here in the Lowcountry, especially along our waterways, the trees do not reveal the same story. Our most dominant deciduous tree loses it leaves only when new spring buds burst forth and push last year’s foliage from the branch. The Live Oak, as a result, appears to be ever green. Even in the depths of winter, our maritime forest remains a beautiful collection of deep greens. In and around the salt marsh, the change of season presents itself in much more subtle ways. Just look to the grasses, they are our signpost distinguishing winter from spring, spring from summer and summer from fall. Cordgrass, or more appropriately Spartina Alterniflora, is a freshwater perennial grass that blankets the edges of saltwater creeks, rivers and sounds, all along the Eastern seaboard. Beaufort County has the most salt marsh of any county in the state and South Carolina has the most salt marsh of any state in the country. During the spring, tender shoots erupt from the mud giving the marsh a somewhat two-toned appearance; bright green at the base and brownish gray on top. 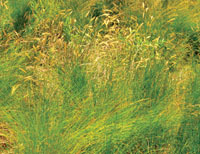 In the summer, the grasses mature to a height of about five or six feet. Having displaced most the previous year’s crop, it is vibrantly green. Think of any shade of green. It’s out there! With the arrival of fall, the crisp green blades yield to golden seed heads. In response to evening sea breezes, the vast marshlands become undulating fields of amber and gold and saffron. As winter settles in, the grasses have completed their natural cycle. Dying away, becoming brittle, brown and gray, the season’s crop will continue to deteriorate. While a significant amount of detritus remains in the salt marsh, providing fertilizer in both mud and water, some of the dead grasses will collect in great wracks. In a tide-dependent process of one-step-forward, two-steps-back, the wracks will move out of the creeks, into the rivers and sound, around to the ocean and wash upon the shoreline. This is a critically important part of the circle of life for the cordgrass and our Island. Once on our beaches, these wracks of cordgrass form the foundation for our dune system, as well as providing rich nutrients for plants and animals that inhabit the ocean side of Hilton Head. Fall is an amazing time to visit the salt marsh. Get Outside and enjoy the graceful transformation for yourself! For over 30 years, Outside Hilton Head has provided personalized adventures for all ages, from kayak, fishing, nature and dolphin tours to kid’s camps, history excursions, family outings and stand-up paddle boarding. “The Island’s outdoor outfitter” also offers an outstanding selection of clothing, gear and accessories for men, women and children at the flagship store in the Plaza at Shelter Cove and a second location in Palmetto Bluff. (843) 686-6996 or outsidehiltonhead.com.